Since preprocessing, compiling, and linking are commonly viewed as steps of a single attempt to create an executable file, they can be collectively referred to as "building" process. Usually, if one of the steps fails, the building stops, with error descriptions printed either to the command window, or to the output window of the IDE. A file is the traditional unit of storage in the file system. Similarly, file is also the traditional unit of program compilation. A user presents a source file to the compiler. The result of preprocessing is called a translation unit, which now looks like a single file to the compiler. This unit is what the compiler understands and what the C++ language rules describe. C++ compiler automatically invokes preprocessor (described above), which forms a translation unit from our program file. C++ translates the unit into the object code and saves it as an intermediate file on disk. The resulting object code produced by the compiler is incomplete. It lacks actual memory addresses of functions and data variables defined elsewhere. An example of such gap is a system function call to print characters on the screen. Although compiler does construct a CALL assembly instruction, the actual address of the function to call remains unresolved at this stage. The linker is the program that binds together all separately compiled parts. A linker links the object code with the code for the missing functions to produce an executable image, and creates executable file on disk. C++ and operating system object libraries supply the missing functions. The program now can be loaded into memory and executed. 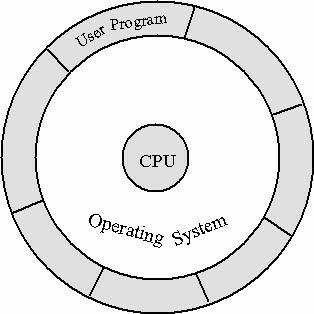 The operating system occupies the layer between user programs and the central processing unit, or CPU for short. 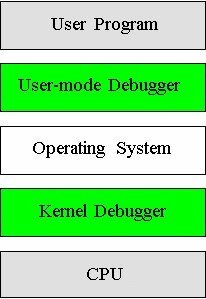 User-mode debugger is a type of process that tells the CPU to execute processor instructions in a single step mode. The debugger loads the user program in a separate process. In this setting, debugger is a parent, and the user program is a child process. Debugger can execute user program one statement at a time, helping programmers to detect and investigate "bugs". Debuggers are valuable run-time tools to locate and remove logic errors. Microsoft VC++ has its own debugger with graphical user interface. Kernel-mode debuggers (KDs) are similar to the user-mode debuggers, but when KD stops execution, entire operating system stops. KD debuggers often support an interface that allows the programmer to remotely control its functions from another computer, connected via a null-modem cable. KD debuggers allow developers to detect bugs in components of the operating system, such as the device drivers. Although the CPU executes individual program instructions, the operating system has a mechanism to interrupt the execution of a user program and give the execution time slice to another program. This type of task scheduling creates an impression to the user that all programs are running in parallel. Computer memory is composed of storage cells sometimes referred to as words. Each cell has a unique numeric address associated with it, which identifies its location in the memory. The number of memory cells in a computer varies but is usually measured in millions of cells. Each memory cell contains a binary number made up of a series of binary digits or bits, usually 8, 16, 32 or 64. A binary digit has two possible values 0 or 1. A binary number is therefore comprised of a sequence of 0s and 1s. The digits contained in each cell are represented by voltage levels with peaks representing 1s and troughs 0s. A group of 8 bits is called a byte. The size of memory is usually expressed in the unit kilobyte, shortened to Kb, which is 1024 (210) bytes. Storage capacity can also be expressed as a number of megabytes (Mb) approximately a million (220 = 1048576) bytes, or gigabytes (Gb) approximately a (US) billion (230 = 1073741824) bytes. which would evaluate to the number 4DD0 in hexadecimal form. Note that each memory address is represented by a unique number - in practice this is usually a hexadecimal number. 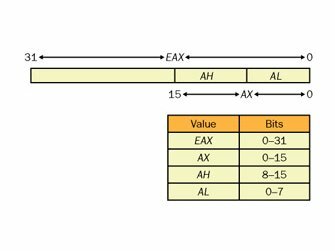 The lower end of the memory addresses range is often referred to as low memory (the other end is high memory). The operating system is normally located in low memory. 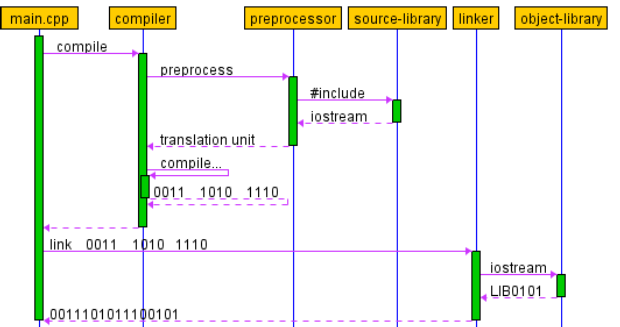 The latest diagram zooms in on the Intel CPU and program in memory. The CPU has its own built-in memory: the registers. Instruction pointer always points to the next instruction that processor is about to execute. The instruction gets loaded from memory into the instruction register. General-purpose registers hold instruction operands, results of calculation, and also point to the temporary data storage in memory, that is, contain addresses of the memory reserved for program stack. Program stack provides memory for temporary data, such as temporary variables. moves the value from register EBX to the memory location specified by the address stored in register EAX. 0xC0000005: Access violation writing location 0x00411a2e. Indeed, user-mode programs are not allowed to modify executable code in memory. This time, program compiles and runs fine. If you run it in debug mode, you should be able to see how x changes from zero to five. Our examples demonstrated that computer memory is a large array of memory locations. Each location has a unique address. A program loads into memory in three logical segments: code, data, and stack; each of them having their own address space. Address space that does not belong to our program is off limits to us: an attempt to use that memory will result in error known as access violation exception. Our own program code is read-only to our program. Each compiled program contains a sequence of processor instructions. 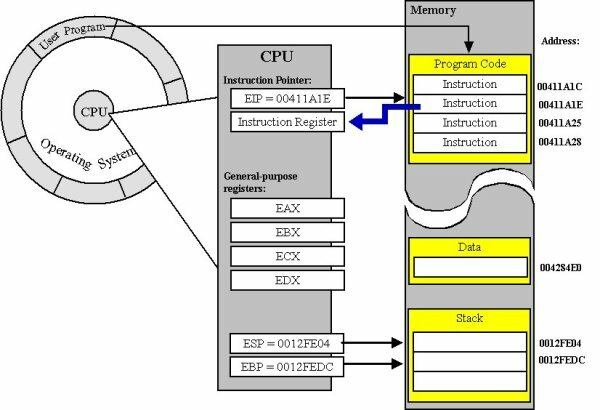 An instruction is the smallest command that the processor can execute at one time. Instructions vary in size and can have one, two, or no operands. Registers are a few of the most important computer resources: they are the fastest type of memory directly referenced inside CPU instructions. Registers are used heavily when the data is moved to and from memory locations. C++ allows direct inserts of the assembly code into programs. The compiler translates in-line assembler commands into CPU instructions. In many cases, when your program crashes, the real difference between solving the bug and screaming in frustration comes down to how well you can read a little assembly language!